Today Defective by Design, through the Free Software Foundation, joined twenty-six other organizations in releasing a joint letter to the World Wide Web Consortium (W3C), the Web's standards-setting body, condemning Encrypted Media Extensions (EME). EME is a proposal to incorporate support for Digital Restrictions Management (DRM) into HTML, the core language of the Web. Please join the FSF and our allies in stopping EME and keeping DRM out of HTML by signing the petition that goes along with the sign-on letter! Our goal is to reach 50,000 signatures by May 3rd, the International Day Against DRM, at which point we'll hand-deliver them to the W3C. The coalition opposing EME includes the FSF and its sister organizations FSF Europe, Latin America, and India; the Electronic Frontier Foundation; Creative Commons; Fight for the Future; Open Knowledge Foundation; Free Culture Foundation; April; Open Technology Institute; and several national pirate parties. It's uplifting to see that so many influential organizations are ready to stand with us against this threat to freedom on the Web. In the letter (full text here), we point out that "DRM restricts the public's freedom, even beyond what overzealous copyright law requires," and warn that for the W3C, "ratifying EME would be an abdication of responsibility; it would harm interoperability, enshrine nonfree software in W3C standards and perpetuate oppressive business models. It would fly in the face of the principles that the W3C cites as key to its mission and it would cause an array of serious problems for the billions of people who use the Web." EME is sponsored by a handful of powerful companies who are W3C members, like Microsoft, Google, and Netflix. These companies have been promoting DRM both for their own reasons and as part of their close relationships to major media companies. 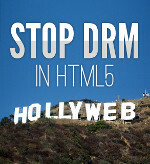 FSF executive director, John Sullivan, said, "Building DRM hooks into HTML is another attempt by Hollywood and its friends to gain control over our home and mobile computers in order to restrict the way we use media on the Web. DRM turns these companies into gatekeepers capable of filtering and controlling not just movies and music but also educational materials -- anything digital. The FSF and its partners won't allow these companies to sneak this change into the Web's core language. We want the World Wide Web, not the Hollyweb." If you haven't already, sign our petition against Encrypted Media Extensions. Share this post with your friends. Use the hashtag #hollyweb if you mention it on a microblogging site. Upvote our Reddit post about EME. Also, we recommend that you check back on May 3rd -- we have a plan for the petition delivery at the W3C, and it's going to be pretty interesting. You can see the FSF's press release about the sign-on letter at https://www.fsf.org/news/coalition-against-drm-in-html. The EFF also has an excellent blog post about EME at https://www.eff.org/deeplinks/2013/03/defend-open-web-keep-drm-out-w3c-standards. The full text of the EME proposal is at https://dvcs.w3.org/hg/html-media/raw-file/tip/encrypted-media/encrypted-media.html.